If you're learning about graphs, you're bound to see a bunch of linear equations, so it's a good idea to understand what makes an equation a linear equation. 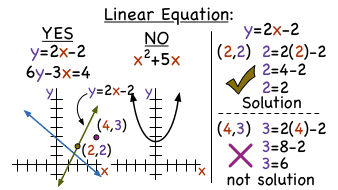 This tutorial explains linear equations and shows you the difference between equations that are linear and ones that are not. Check it out! How Do You Find the X- and Y-Intercepts of a Line in Slope-Intercept Form? To find the x-intercept of a given linear equation, plug in 0 for 'y' and solve for 'x'. To find the y-intercept, plug 0 in for 'x' and solve for 'y'. In this tutorial, you'll see how to find the x-intercept and the y-intercept for a given linear equation. Check it out!